Jan 31, 2009 / Feb 1, 2009; Lunar meteoroid impact monitoring using Celestron 8" NGT @ f/5.0, Watec 902H2 Ult at prime focus, auto-guided with Nudger; Craterlet to record, VirtualDub to split files and LunarScan 1.4 to detect events. No impact candidate events were detected. Weather was clear with fast moving clouds which interrupted imaging occasionally and ultimately ended it prior to moon set. Jan 29, 2009 / Jan 30, 2009; Lunar meteoroid impact monitoring using Celestron 8" NGT @ f/5.0, Watec 902H2 Ult at prime focus, auto-guided with Nudger; Craterlet to record, VirtualDub to split files and LunarScan 1.4 to detect events. No impact candidate events were detected. Weather was clear and cold. Unconfirmed lunar impact candidate imaged with a Watec 902 H2 Ult and Celestron 8" NGT @ f/5.0. Lunar meteoroid impacts; Lunar meteoroid impact monitoring using Celestron 8" NGT @ f/5.0, Watec 902H2 Ult at prime focus, auto-guided with Nudger; Craterlet to record, VirtualDub to split files and LunarScan 1.4 to detect events. One candidate impact event was found at 00:26:22 UT but will not be confirmed as no other observing stations were active. Quadrantid meteors; 140+ degree FOV, Watec 902H2 Ult; Used Craterlet to record, VirtualDub to split files and MeteorScan to detect events and sent data to Gural. Lunar meteoroid impacts; Lunar meteoroid impact monitoring using Celestron 8" NGT @ f/5.0, Watec 902H2 Ult at prime focus, auto-guided with Nudger; Craterlet to record, VirtualDub to split files and LunarScan 1.4 to detect events. 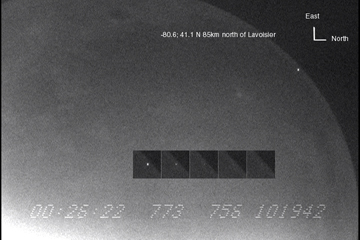 No meteoroid impact candidate events were detected.